Irony of ironies. The town of Tombstone, Arizona, recently proclaimed itself “America’s Second Amendment City” to celebrate its gun-toting past and Arizona’s current status as “the most gun-friendly state in America.” Ironically, the famous gunfight at the OK Corral occurred because the outlaw Clanton gang violated Tombstone’s 1881 gun control law, which required visitors to check their guns at the sheriff’s office until they left town. 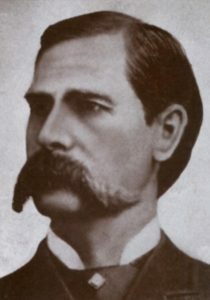 Tombstone’s legendary hero, Wyatt Earp, was attempting to enforce this law when the gunfight erupted. 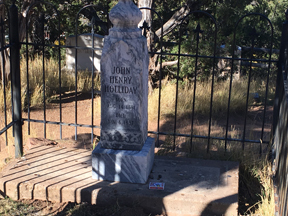 By celebrating guns, Tombstone seems to be siding with the cattle thieves and stage robbers against its own historic law enforcement officers. 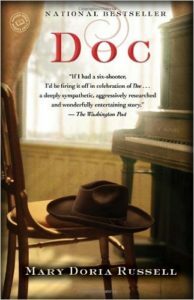 For a great historical novel about Tombstone, check out “Epitaph,” by Mary Doria Russell. 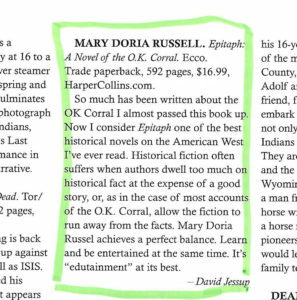 My review of Epitaph, by Mary Doria Russell, was published in the December 2016 issue of Roundup Magazine, by the Western Writers of America. You can’t view the magazine online, so I’ve included an image of it here.